FC Barcelona progressed to the UEFA Champions League semifinals as the Catalans defeated Manchester United with a 3-0 (4-0 on aggregate) margin at the Camp Nou. Lionel Messi scored a brace in the first half followed by Philippe Coutinho's stunning goal in the second half to seal the win for the La Liga champions. Returning with a single goal advantage from the first leg, the Catalans had an arduous task of keeping the Red Devils' attack at the bay. Gerard Pique's heroics and unconvincing attacking from the 13-time EPL champions ensured a 1-0 win for the Blaugrana in the first leg. Ernesto Valverde made one change in the line-up that beat the Red Devils at the Old Trafford, replacing Sergio Roberto with Nelson Semedo at the right-back position. On the other hand, Ole Gunnar Solskjaer made a couple of changes in his starting line-up for the away leg. The Catalans were awarded a penalty early in the game. However, after consulting with the VAR, the referee ruled off the initial decision. Minutes later, the hosts drew the first blood via a splendid left-foot curled effort from the Argentine talisman, Messi - who got the better of David de Gea after gliding past Manchester United defenders across the 18-yard box. 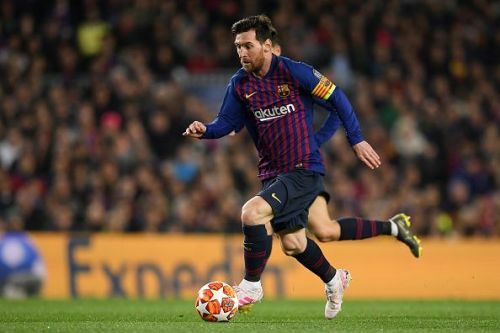 Four minutes later, the five-time Ballon d'Or winner doubled the advantage as he scored another goal from outside of the box - this time using his right foot. In the second half, Coutinho scored a stunning goal against his former rivals to seal the win for the Blaugrana. Messi has been impressive since the start of the season. This term, the 31-year-old has scored 45 goals and set up another 21 for the Blaugrana in all competitions. His goalscoring exploits throughout the season have earned Barcelona, a comfortable lead in the La Liga title, a place in the Copa del Rey final and a spot in the Champions League's last four. Let's take a look at some of the best tweets as Barcelona knocked out Manchester United from the Champions League.